Samsung just one-upped BlackBerry. Even though there are speculations that BlackBerry may finally launch a native Android device with its famed hardware keyboard, Samsung's newly minted Galaxy Note 5 and Galaxy S6 Edge+ comes with an optional keyboard accessory. Both large-screened flagship Galaxy smartphones will come with a hard plastic case, similar to the official case options available for the Galaxy S6. What's unique is that these cases also come with a snap-on hardware keyboard. If you don't need the keyboard, you can stow it by clipping it onto the rear of your phone. When you're ready to pen your next novel, or a long business email, you can unclip the case and snap it on to the front of your device. When it's attached, the keyboard covers the bottom portion of your screen and the Android navigation keys. Don't worry, these Android navigation keys are carried onto the keyboard accessory; they're found just below the standard keyboard layout so you can quickly multitask or jump to the home screen if needed. It really looks like a BlackBerry Passport when the keyboard is in place. Content on your Galaxy Note 5's or Galaxy S6 Edge+'s screen will readjust to fill the space that's left uncovered by the keyboard, so the accessory isn't blocking your view. The keyboard might not be the sexiest accessory for the Galaxy Note 5, but Samsung managed to deliver a simple solution for those who prefer to not use a software keyboard. Typing is extremely comfortable on the sculpted and raised keys of the accessory. Because the individual keys are larger than the keys on a BlackBerry Classic, I found that I can type comfortably and accurately using the tip of my fingers rather than using my fingernails. 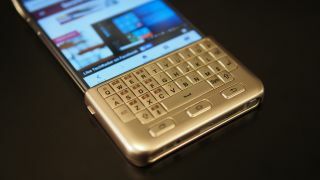 Unlike the unfortunately named third-party Typo 2 keyboard for the iPhone, which has been discontinued, the Samsung keyboard doesn't use Bluetooth to connect to your phone. Instead, it uses a capacitive film on the rear, so when you're pressing down on the keys, the keys would push the film to register a signal on the phone. The benefit is that you don't need to charge the keyboard, and there is no lag between typing and seeing words appear on the screen. The downside is that since the keyboard doesn't have its own battery, it's not backlit. This shouldn't be a problem if you're using the keyboard during the day, but you may have a hard time hunting for the right key to press in the dark. Another thing you'll miss when the keyboard is on is access to the Note 5's embedded fingerprint scanner. As the keyboard covers the device's home button, you'll want to scan and unlock your phone before snapping on the keyboard. You'll still have access to the home button function with the keyboard on, but you won't be able to use the biometric security function. Because of the large size of the devices, I found that two hands were required to type using the keyboard. With the keyboard and the case on, the Galaxy Note 5 is thicker, but is more comfortable to grip. The plastic used for the Samsung keyboard feels a little cheap, but the overall package feels more balanced and less top-heavy than the Typo 2 keyboard case. I found that the keys on the Samsung keyboard are less stiff and easier to press than the keys on the Typo 2. After typing a few medium-length emails, stiffer keys on the Typo 2 for the iPhone 6 meant I would experience finger fatigue, but I didn't notice that with Samsung's keyboard for the Note 5. As there isn't a trackpad or trackball like on the BlackBerry Classic, you'll still have to move your hands between the keyboard and the touchscreen to make on-screen selection, move your text input cursor and make edits.